Global Travel Media » Blog Archive » Murray River Walk rising with Riverland tourism. Murray River Walk rising with Riverland tourism. 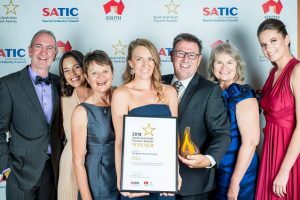 Murray River Walk has again won the highly contested Ecotourism category at the 2018 South Australian Tourism Awards, reflecting the importance of nature-based tourism and the phenomenal growth in Riverland tourism. Driven by the “Millennium drought” and the need to diversify the Riverland economy, managing Director of Murray River Walk – Tony Sharley – sought to turn the most spectacular and vulnerable river landscapes into a walking and cruising discovery of nature, wildlife, innovative winemaking, sustainable farming and new stewardship of environmental water. Murray River Walk supports many Riverland businesses including the Renmark Community Hotel where 65% of its customers stay before they depart. Customers also stay at award winning The Frames and Big 4 Renmark Riverfront Holiday Park. Houseboats are hired from award winning River Murray Houseboats. Locally roasted coffee is supplied by Arrosto Coffee and locally farmed Murray Cod is supplied by Parker Cod. The 4 day menu is created by former local and native food pioneer Andrew Fielke, and wines are sourced from 8 producers who are revolutionising the Riverland wine region. Each tour finishes with an Aussie barbecue and tour at the popular Wilkadene Woolshed Brewery. Mr Sharley praised the roles of SA Tourism Industry Council, SA Tourism Commission, SA Department for Environment and Water and Destination Riverland for their encouragement and support of new tourism businesses and building the capacity of an industry vital to growing the State’s economy. He also congratulated other Riverland winners – The Frames and Big 4 Renmark Riverfront Holiday Park. 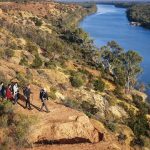 Murray River Walk will now contest the Australian Tourism Awards in February 2019 up against the best Ecotourism experiences in Australia, where it won Silver in 2018 at its first attempt.